Swedish rock legends Europe have released a video for their epic album track Turn To Dust. The song is also being released as a 7" single to mark this year's Record Store Day. 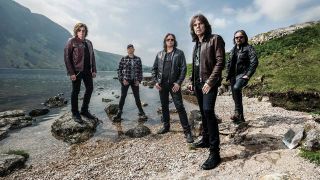 "This song idea has been brewing for over ten years”, says singer Joey Tempest. “When recording our latest album, Walk The Earth, in Abbey Road Studios, the inspiration finally kicked in to finish it. "Originally an idea and labour of love of our keyboards player Mic Michaeli, the video was meant to touch on emotions and observations related to the Life and Death of your near and dear ones, the circle of life if you will, but it turned out to be much more than that as it follows the dramatic journey of the character taken from the artwork on our album cover. "A video like this is a very difficult thing to get right," adds Hooper. "The song is layered with emotion and meaning and to capture that in images is tricky to say the least. The band decided the only way to do the song justice was through animation, where images are limited only by your imagination and together we roughed out a treatment. "It wasn’t until the final frame was finished that we saw we had produced something special, something that I hope does a good enough job of representing such an amazing and heartfelt song. That’s up to viewers to decide." Europe have three Japanese dates at the end of this month, before returning to mainland Europe for a series of summer shows.